"I would like to write you a few words to sum up our class development in Poland in the past season, and our future plans for near future. Catamaran sport is developing in Poland with the fleet growing from year to year but due to some recession in Europe, not so significant as it was 3 or 4 years ago. The fleet is getting better in terms of quality every year with more crews sailing on the latest designs. The A-class is the fastest growing and most competitive class with many young sailors being attracted and entering regattas. As mentioned before the growing fleet includes now the latest boats and designs, and the level of competitiveness is still raising. Now we have around 30 A-class sailors in our association, and every year there are a lot of new incomers declaring their will to buy a boat. 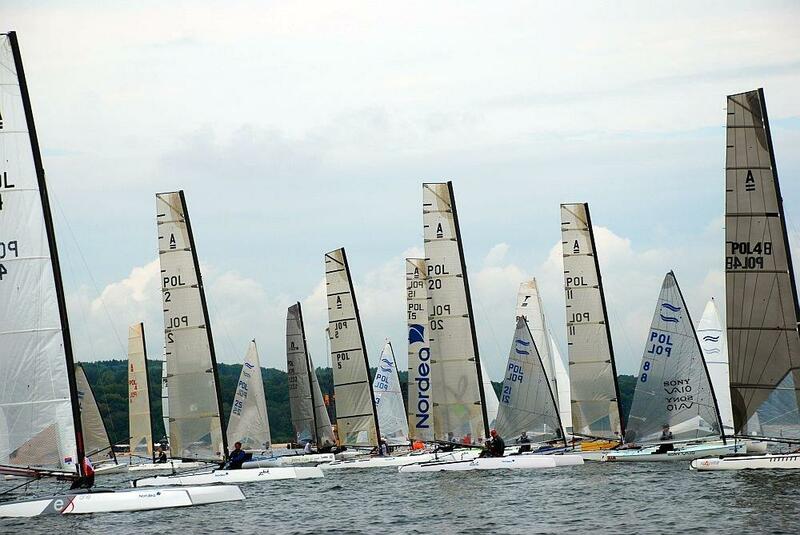 Poland is the only eastern European country with such a fleet of A-class sailors with its national championship regatta tour. Try to keep in mind that wages in Poland still are not on the same level as in the old EU countries, and with sailing gear being rather expensive it is a bigger effort to enter this class for any sailor. This year our club will be moved to new facilities in a modern sailing center that is being located in the heart of the most popular summer resort in Poland (Sopot), right next to the beach of Gdańsk Bay in the most attractive area in the city. Gdańsk Bay is a perfect venue for catamaran sailing and training offering a vast sailing area (sea conditions) but with a moderate conditions thanks to the Hel Peninsula securing it from roughness and waves of the open sea. Having a new modern facility and possibly one of the best sailing areas for catamarans with wide, sandy beaches, and the most popular in the country, a long wooden pier that is fully crowded during summer and a modern Marina, right next to our club in the heart of a 1mln people agglomeration, we think that it is a great place to have a spectacular, big fleet A-class regatta of the highest rank. Having that and a modern hotel base in the most popular summer resort in Poland, we hope to have your support during next voting for the Europeans or Worlds venue. As a crucial thing for the future is to attract more young sailors to the class. To do so, on every regatta we give prizes to first 3 junior crews; I think it is very important for them to be able to have some achievements that they can mention and share and it motivates them to harder work and attracts some others to join the world of fast sailing. Maybe we could consider to distinguish first 5 or 10 junior sailors in some major events in the future and maybe to have a separate junior standings apart of the overall scoreboard. A diploma doesn’t cost anything – besides the cost of a nice paper sheet. Having the Americas Cup this year and catamarans back to the Olympics we hope for a dynamic and stable growth of interest in catamaran sailing."